The RID system provides natural pest control, natural mosquito misting control and organic fertilizer through your sprinkler system. Precision engineered and patented technology that fits in line with your existing sprinkler system to provide unmatched safe and natural pest control, natural mosquito control and lawn control. The RID System doesn't require any expensive or difficult underground work - it works as a simple add-on to your sprinkler system. You have several different environmentally friendly pest control treatments to choose between - and adding these treatments is as easy as changing a bottle. The system also works with organic liquid lawn fertilizers to evenly apply nutrients throughout your yard. Simply install the RID System and add the liquid solution that fits your needs. just sit back, relax, and let your sprinkler system do the work. 1 gallon containers of Pest Control Concentrate, Mosquito Control Concentrate, and Fertilizer Concentrate are available. What is the R.I.D. System? products designed for use with our system that provide a non toxic, organic natural environment for your loved ones. How do I install the R.I.D. System? 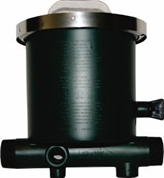 The device installs between your backflow prevention and solenoid valves. NOTE: It is very important to have a proper backflow prevention device installed as required by local codes. You should consult a qualified plumber or irrigation professional if you have any questions about backflow prevention or need installation assistance. If you need an installer for your area call us and we can assist you. expensive and can not match the versatility of the RID System. What other products can I use in the R.I.D. System? Our products our specially formulated to work with the R.I.D. system and are engineered not to damage your sprinkler system. We cannot give any recommendations other than our products.